File photo by Ryan Ozawa. An alliance of Waialua High and Waiakea High Schools won the 2nd Annual American School in Japan VEX Robotics Tournament held today in Tokyo, hosted by the American School in Japan. Two teams of students and coaches from Waialua, Oahu, three teams from Waiakea and one team from Kohala, Big Island, competed against teams from Tokyo, Yokohama, Taiwan and Thailand. Waialua High School also won the Best Build award. 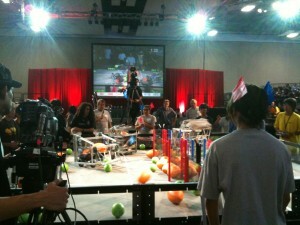 VEX Robotics competitions are being held in many different cities, states and countries, including eight tournaments hosted in Hawaii as well as the Pan Pacific VEX Robotics Championships, scheduled for December 3-5, 2010 at the Hawaii Convention Center. Students, with guidance from their teachers and mentors will aim to build the most innovative robots possible and work together to obtain the most points possible. In addition to just having a great time and building amazing robots, through their participation in the VEX Robotics Competition and their work within their team, students learn many academic and life skills. While in Japan, Hawaii’s high school students are visiting an underwater robotics laboratory in Yokohama for a tour, in addition to visiting cultural sites throughout the country. VEX Robotics is one of six major educational robotics programs in Hawaii. Recognizing the importance of promoting robotics at an early age and sustaining students’ interest in STEM education throughout their schooling, Hawaii’s six robotics programs (FIRST Robotics, Botball, Underwater ROV, VEX Robotics, Micro Robotics, FIRST LEGO League) have joined together to form the Hawaii Robotics Organizing Committee (ROC). As a critical component of the Hawaii Innovation Initiative, robotics engages students in science, technology, engineering and math (STEM) education and provides them with the teamwork, critical thinking and problem-solving skills they need to compete in the 21st century workplace. To learn more about robotics education in Hawaii and for a complete schedule of robotics competitions occurring across the state, visit www.hawaiiroc.org.